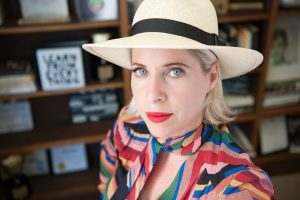 Honored by Newsweek as one of the “Women Shaping the 21st Century,” Tiffany Shlain is an Emmy Nominated filmmaker, founder of the Webby Awards, co-founder of The International Academy of Digital Arts & Sciences, and CEO of Let It Ripple film studio. Her films and work have received 80 awards, including a Disruptive Innovation Award from Tribeca Film Festival. Four of her films premiered at Sundance Film Festival, including her feature documentary Connected: An Autobiography about Love, Death & Technology, which The New York Times hailed as “Examining Everything From the Big Bang to Twitter.” Tiffany’s films were also selected for the American Film Showcase including Connected, Brain Power: From Neurons to Networks; The Science of Character; and, The Adaptable Mind. Tiffany’s recent films employ a new way of making films that she calls “Cloud Filmmaking,” where she makes films collaboratively with people all over the world and then creates Global Screening days. The Science of Character was viewed globally at over 93,000 screening events in 125 countries at schools, organizations and embassies for the global event her film studio Let It Ripple hosts called Character Day. All the screenings are linked together through a global Q & A with thought leaders on the subject. This year Let it Ripple is launching 50/50 Day, a global day of screenings of Tiffany’s recent film “50/50: Rethinking the Past, Present & Future of Women + Power” and discussions about what it’s going to take to get to a more gender balanced world. Information on both global screening days can be found at www.letitripple.org. Tiffany traveled to South Africa (2012) and Israel (2013) with AFS, and continues to host a series of “Cloud Filmmaking Salons” online via AFS for students around the world, most recently in Cairo, Egypt. She made a short film about her experience called Punk Rock Diplomacy. Tiffany’s original film series for AOL Originals The Future Starts Here explores humanity’s co-evolution with technology, received over 40 million views, and was nominated for an Emmy Award. Her films have been translated into multiple languages with over 50 million views.